SBS Transit Bus Service 161 is a trunk service plying between Hougang Central Interchange and Woodlands Interchange, passing through Hougang Avenue 10/6/8/4, Buangkok, Sengkang, Punggol Road, TPE, SLE and Woodlands Avenue 2. A large portion of the route plies along the TPE/SLE corridor. 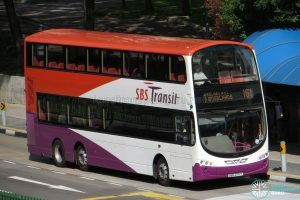 Service 161 is a residential inter-town route connecting Hougang and Sengkang with Woodlands. It incorporates a long express sector (~16km) between Punggol Road and Woodlands Avenue 2 along Tampines Expressway and Seletar Expressway, one of the longest unbroken express sectors for any trunk route in Singapore. 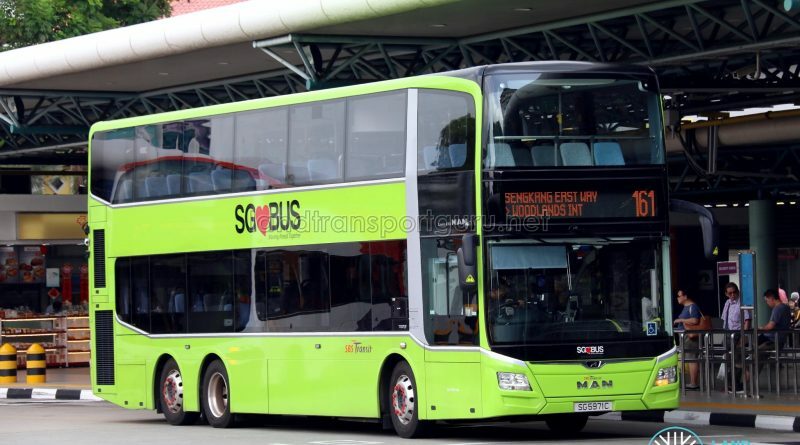 The route benefits from good demand throughout the day, with significantly higher demand during weekday peak hours from educational institutions at Woodlands, notably Innova Junior College and Republic Polytechnic (RP). 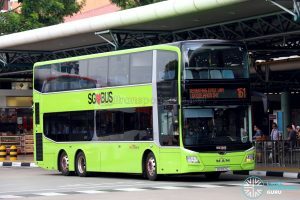 The Bus Service Operating License (BSOL) for this route will be renewed in 2021 under the Sengkang – Hougang Bus Package. 2002: No significant route changes since 2002. Why Does Bus Service 161 Also Served By Single Deck Bus?I Thought The Bus Is Only Served By Double Deck Bus.These Bus Service With A Double Deck Bus Only Cannot Be Deployed On The Single Deck Bus. I have the intention to get a Adult Monthly Travel (AMT) fare card at $120. Everyday I took bus 161 from Hougang interchange to Woodland interchange. Is bus 161 considered a Express Bus or Basic Bus? AMT card only can used on basic. Service 161 is a basic bus service. AMT Pass can be used on this service.